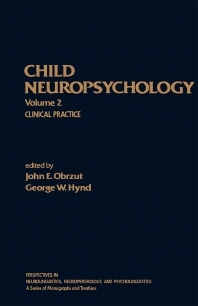 Child Neuropsychology, Volume 2: Clinical Practice attempts to bridge the gap between neurodevelopmental theory and clinical practice with a pediatric population. The focus is on some of the more common neuropsychological disorders encountered in children, along with neuropsychological evaluation, intervention, and treatment. Comprised of 11 chapters, this volume begins with an overview of issues and perspectives in clinical child neuropsychology, followed by a discussion on neurodevelopmental learning disorders in children. The neuropsychological basis of psychiatric disorders in children are then examined, together with epilepsy and closed-head injury as well as different approaches and issues relevant to neuropsychological evaluation of children. Subsequent chapters deal with the importance of soft signs and neuropsychological screening; neuropsychological assessment of children; actuarial and clinical assessment practices; and intervention and treatment. The book also presents an overview of how one might conceptualize and integrate differential diagnosis of neurodevelopmental learning disabilities with appropriate curriculum-based intervention strategies. The final chapter considers the broader applications of behavioral neuropsychology. This book is relevant to clinical child or pediatric neuropsychologists, child or school psychologists, physicians interested in pediatric neuropsychological disorders, and other professionals who provide services to children with neurologically based disorders. It may also serve as a reference for audiologists, speech and language therapists, or educators.